Presenting this set of slides with name - Brand Positioning Powerpoint Presentation Slides. 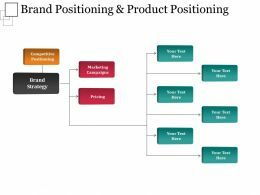 The stages in this process are Strategy Positioning, Positioning Plan, Brand Positioning. 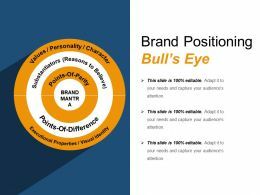 Presenting brand positioning bulls eye template powerpoint guide. 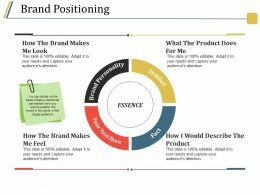 This is a brand positioning bulls eye template powerpoint guide. This is a three stage process. 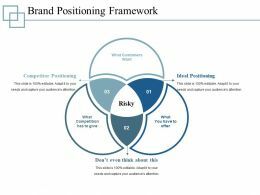 The stages in this process are brand positioning bulls eye, branding, brand strategy. 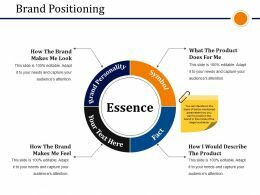 Presenting brand positioning ppt sample download. This is a brand positioning ppt sample download. This is a four stage process. The stages in this process are brand personality, essence, facts, symbols, business. Presenting this set of slides with name - Brand Communication Powerpoint Presentation Slides. This is a one stage process. The stages in this process are Brand Equity, Brand Communication, Brand Awareness. 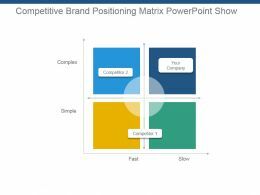 Presenting competitive brand positioning matrix powerpoint show. This is a competitive brand positioning matrix powerpoint show. This is a four stage process. The stages in this process are complex, simple, fast, slow, your company, competitor 1. 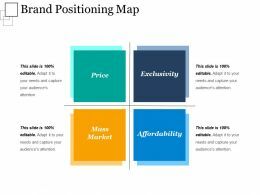 Presenting brand positioning map powerpoint slide background. 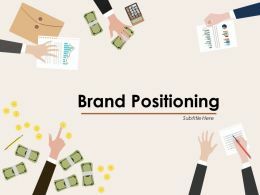 This is a brand positioning map powerpoint slide background. This is a four stage process. The stages in this process are brand strategy, brand positioning, brand management. 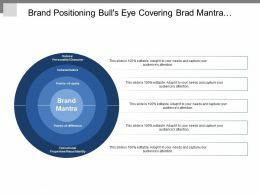 Presenting this set of slides with name - Brand Positioning Bull S Eye Covering Brad Mantra. This is a five stage process. The stages in this process are Brand Positioning Bull S Eye, Brand Management, Brand Strategy. 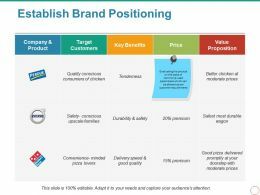 Presenting brand positioning example powerpoint presentation. This is a brand positioning example powerpoint presentation. This is a three stage process. The stages in this process are brand strategy, brand positioning, brand management. 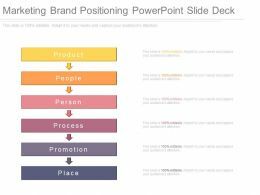 Presenting brand positioning powerpoint slide information. This is a brand positioning powerpoint slide information. This is a four stage process. The stages in this process are value proposition, quality, own product, competitor. Presenting this set of slides with name - Brand Positioning Presentation Images Template 1. This is a four stage process. The stages in this process are Symbols, Facts, Brand Personality, Brand Positioning, Business. 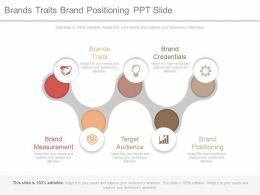 Presenting this set of slides with name - Brand Positioning Model Ppt Show. This is a five stage process. The stages in this process are Purpose, Values, Process, Infrastructure, More Rational And Tangible. 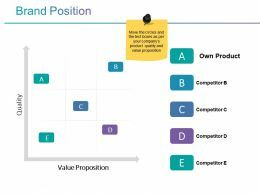 Presenting this set of slides with name - Brand Positioning Company And Product Target Customers Value Proposition. This is a five stage process. The stages in this process are Brand Positioning, Brand Marketing, Brand Promotion. Presenting unique effective brand positioning ppt sample presentations. This is a effective brand positioning ppt sample presentations. This is six stage process. The stages in this proces are place, promotion, process, product, people, persona. Presenting brand positioning powerpoint themes. This is a brand positioning powerpoint themes. This is a four stage process. The stages in this process are brand personality, symbol, fact, essence. 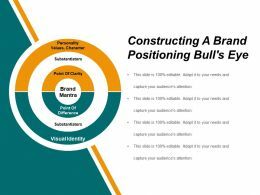 Presenting constructing a brand positioning bulls eye powerpoint shapes. This is a constructing a brand positioning bulls eye powerpoint shapes. This is a two stage process. 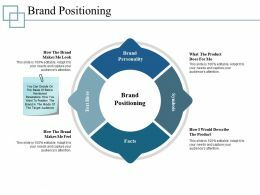 The stages in this process are brand positioning bulls eye, branding, brand strategy. 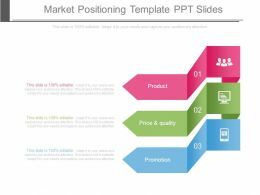 Presenting market positioning template ppt slides. 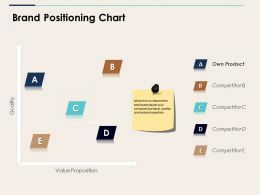 This is a market positioning template ppt slides. This is three stage process. The stages in this process are product, price and quality, promotion. Presenting this set of slides with name - Brand Positioning Ppt Background Images. This is a four stage process. The stages in this process are Brand Personality, Facts, Symbols, Business, Marketing. Presenting brand management using social media powerpoint templates. 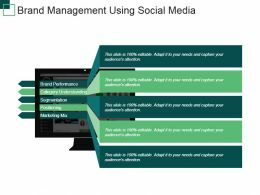 This is a brand management using social media powerpoint templates. This is a five stage process. The stages in this process are brand performance, category understanding, segmentation, positioning, marketing mix. 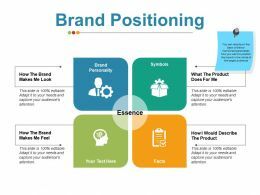 Presenting brand positioning ppt images gallery. 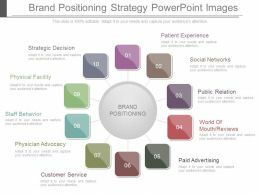 This is a brand positioning ppt images gallery. This is a four stage process. The stages in this process are brand personality, symbols, facts, how the brand makes me look, how the brand makes me feel. 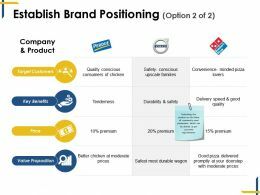 Presenting this set of slides with name - Brand Positioning Framework Ppt Styles. This is a three stage process. 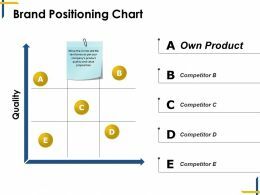 The stages in this process are Competitor Positioning, Risky, Ideal Positioning, Don T Even Think About This, Business. 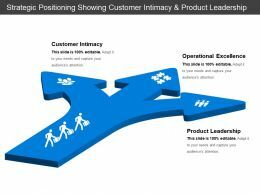 Presenting strategic positioning showing customer intimacy and product leadership. 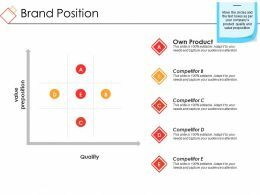 This is a strategic positioning showing customer intimacy and product leadership. This is a three stage process. 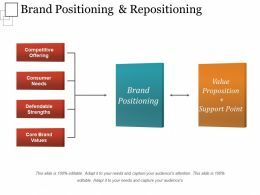 The stages in this process are strategy positioning, positioning plan, brand positioning. Presenting brand position powerpoint templates. 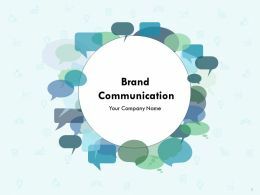 This is a brand position powerpoint templates. This is a five stage process. The stages in this process are quality, value proposition, own product, competitor. 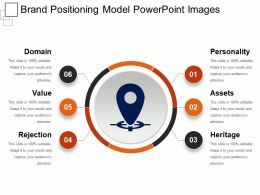 Presenting brand positioning model powerpoint images. This is a brand positioning model powerpoint images. This is a three stage process. 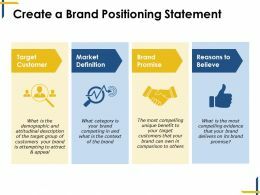 The stages in this process are brand positioning bulls eye, branding, brand strategy. 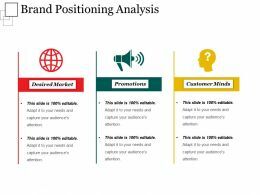 Presenting brand positioning analysis powerpoint templates. 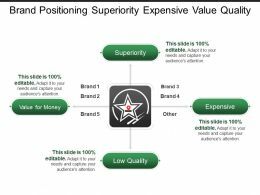 This is a brand positioning analysis powerpoint templates. This is a three stage process. The stages in this process are brand strategy, brand positioning, brand management. 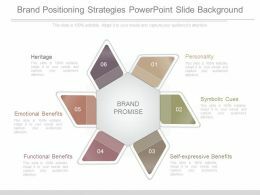 Presenting brand positioning attributes powerpoint graphics. This is a brand positioning attributes powerpoint graphics. This is a four stage process. The stages in this process are brand strategy, brand positioning, brand management. 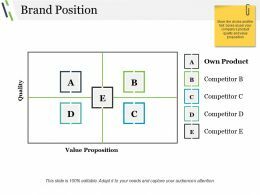 Presenting brand positioning components powerpoint guide. 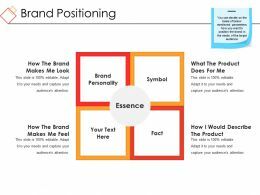 This is a brand positioning components powerpoint guide. This is a two stage process. The stages in this process are brand strategy, brand positioning, brand management. Presenting brand positioning statement powerpoint show. This is a brand positioning statement powerpoint show. This is a three stage process. The stages in this process are brand strategy, brand positioning, brand management. Presenting this set of slides with name - brand positioning ppt example file. This is a four stage process. 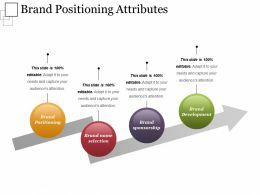 The stages in this process are Brand Personality, Symbols, Facts, Brand Positioning. Presenting brand positioning powerpoint slide themes. This is a brand positioning powerpoint slide themes. This is a four stage process. The stages in this process are essence, attribute, positioning, identify. Presenting brand positioning powerpoint slide influencers. This is a brand positioning powerpoint slide influencers. This is a four stage process. The stages in this process are brand personality, symbols, facts, essence. Presenting establish brand positioning ppt ideas. This is a establish brand positioning ppt ideas. This is a three stage process. The stages in this process are target customers, tenderness, quality conscious consumers of chicken, value proposition, price. 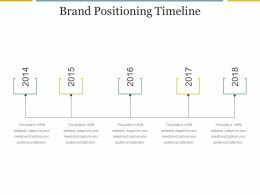 Presenting brand positioning timeline powerpoint guide. 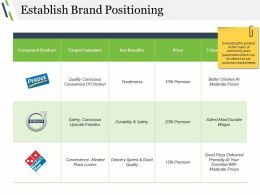 This is a brand positioning timeline powerpoint guide. This is a five stage process. The stages in this process are timeline, business, marketing, strategy, years. 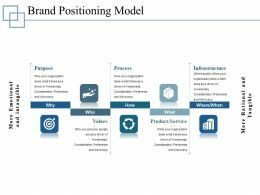 Presenting establish brand positioning ppt model. 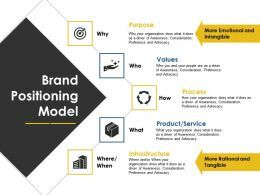 This is a establish brand positioning ppt model. This is a four stage process. The stages in this process are target customers, company and product, key benefits, price, value proposition. Presenting establish brand positioning ppt presentation. This is a establish brand positioning ppt presentation. This is a three stage process. The stages in this process are target customers, key benefits, price, value proposition, company and product. Presenting establish brand positioning ppt background. This is a establish brand positioning ppt background. This is a three stage process. The stages in this process are key benefits, price, value proposition, company and product. Presenting brand positioning presentation powerpoint templates. This is a brand positioning presentation powerpoint templates. This is a four stage process. The stages in this process are brand personality, symbol, fact, how the brand makes me look, how the brand makes me feel. 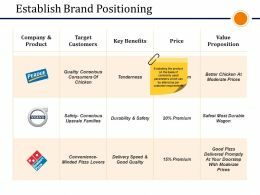 Presenting this set of slides with name - Brand Positioning Chart Ppt Summary. This is a five stage process. 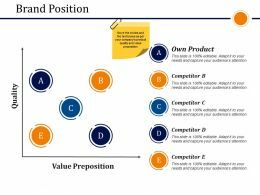 The stages in this process are Value Proposition, Quality, Business, Marketing, Strategy. 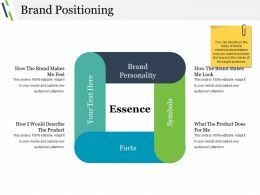 Presenting this set of slides with name - brand positioning chart powerpoint topics. This is a five stage process. The stages in this process are Business, Management, Matrix, Strategy, Marketing. 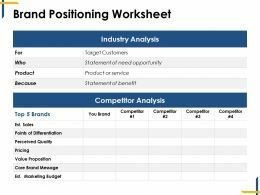 Presenting this set of slides with name - brand positioning worksheet ppt examples. This is a two stage process. 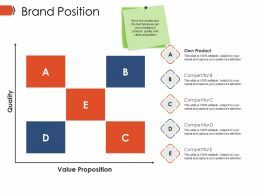 The stages in this process are Points Of Differentiation, Competitor Analysis, Pricing, Value Proposition, Perceived Quality. 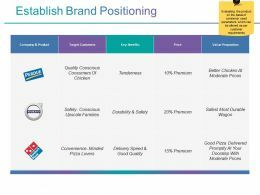 Presenting this set of slides with name - brand positioning framework ppt examples. This is a three stage process. 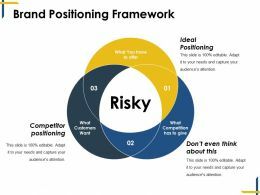 The stages in this process are Competitor Positioning, Ideal Positioning, Dont Even Think About This. 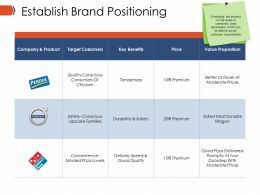 Presenting this set of slides with name - Brand Positioning Example Ppt Presentation. This is a four stage process. The stages in this process are Brand Personality, Symbols, What The Product Does For Me, How I Would Describe The Product. Presenting this set of slides with name - Establish Brand Positioning Ppt Slides. This is a three stage process. The stages in this process are Company And Product, Target Customers, Key Benefits, Price, Value Proposition. 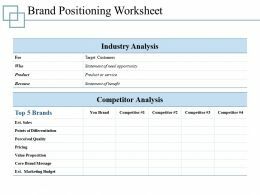 Presenting this set of slides with name - Brand Positioning Worksheet Ppt Model. This is a two stage process. The stages in this process are Points Of Differentiation, Pricing, Because, Business, Marketing. Presenting this set of slides with name - establish brand positioning ppt design. This is a four stage process. The stages in this process are Target Customers, Key Benefits, Price, Value Proposition. Presenting this set of slides with name - establish brand positioning ppt icon. This is a three stage process. The stages in this process are Target Customers, Key Benefits, Price, Value Proposition. 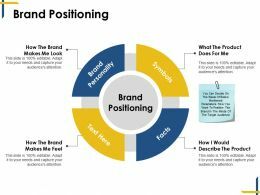 Presenting this set of slides with name - Establish Brand Positioning Presentation Diagrams. This is a three stage process. The stages in this process are Company And Product, Target Customers, Key Benefits, Price, Value Proposition. Presenting brand position ppt presentation examples. This is a brand position ppt presentation examples. This is a four stage process. 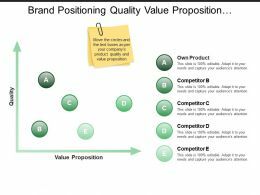 The stages in this process are own product, value proposition, quality, brand position, business. Presenting brand position ppt examples slides. This is a brand position ppt examples slides. This is a five stage process. The stages in this process are quality, value proposition, competitor, own product. 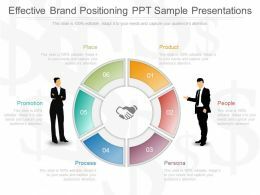 Presenting brand position sample ppt files. This is a brand position sample ppt files. This is a five stage process. The stages in this process are own product, value preposition, quality. Presenting brand position ppt example professional. This is a brand position ppt example professional. This is a five stage process. The stages in this process are quality, value proposition, own product. Presenting this set of slides with name - Brand Position Powerpoint Slide Introduction. This is a five stage process. The stages in this process are Quality, Value Proposition, Own Product, Competitor. Presenting brand positioning and product positioning ppt background. This is a brand positioning and product positioning ppt background. This is a three stage process. The stages in this process are brand strategy, brand positioning, brand management. 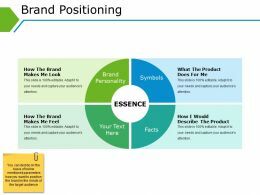 Presenting brands traits brand positioning ppt slide. 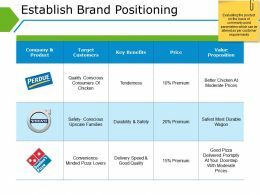 This is a brands traits brand positioning ppt slide. This is a five stage process. The stages in this process are technology, strategy. 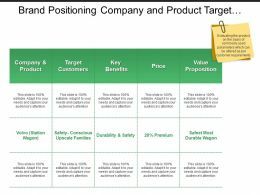 Presenting brand positioning bulls eye target powerpoint graphics. This is a brand positioning bulls eye target powerpoint graphics. This is a three stage process. 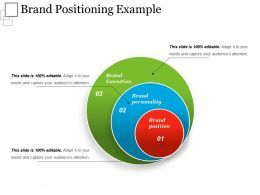 The stages in this process are brand positioning bulls eye, branding, brand strategy. Presenting brand positioning bulls eye example ppt slide. This is a brand positioning bulls eye example ppt slide. This is a one stage process. 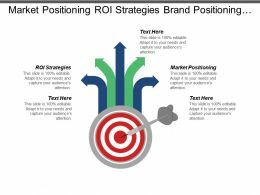 The stages in this process are brand positioning bulls eye, branding, brand strategy. 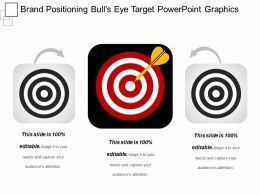 Presenting brand positioning bulls eye powerpoint ideas. This is a brand positioning bulls eye powerpoint ideas. This is a two stage process. 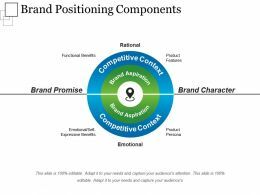 The stages in this process are brand positioning bulls eye, branding, brand strategy. Presenting brand positioning and strategy sample ppt presentation. 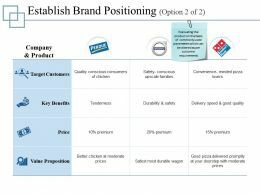 This is a brand positioning and strategy sample ppt presentation. This is a five stage process. The stages in this process are brand strategy, brand positioning, brand management. Presenting brand positioning and advertising example of ppt. This is a brand positioning and advertising example of ppt. This is a three stage process. 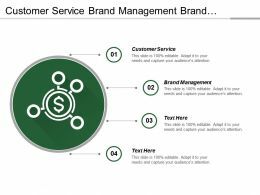 The stages in this process are brand strategy, brand positioning, brand management. Presenting brand positioning and repositioning sample of ppt. This is a brand positioning and repositioning sample of ppt. This is a three stage process. The stages in this process are brand strategy, brand positioning, brand management. 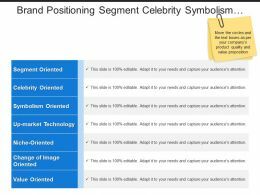 Presenting this set of slides with name - Brand Positioning Segment Celebrity Symbolism Value Oriented. This is a seven stage process. The stages in this process are Brand Positioning, Brand Marketing, Brand Promotion. 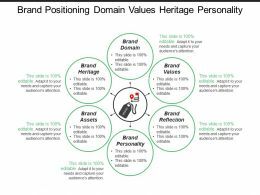 Presenting this set of slides with name - Brand Positioning Domain Values Heritage Personality. This is a six stage process. The stages in this process are Brand Positioning, Brand Marketing, Brand Promotion. 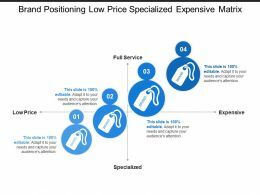 Presenting this set of slides with name - Brand Positioning Low Price Specialized Expensive Matrix. This is a four stage process. The stages in this process are Brand Positioning, Brand Marketing, Brand Promotion. 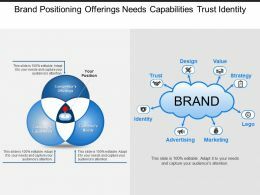 Presenting this set of slides with name - Brand Positioning Offerings Needs Capabilities Trust Identity. This is a three stage process. The stages in this process are Brand Positioning, Brand Marketing, Brand Promotion. 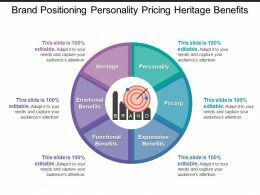 Presenting this set of slides with name - Brand Positioning Personality Pricing Heritage Benefits. This is a six stage process. The stages in this process are Brand Positioning, Brand Marketing, Brand Promotion. Presenting this set of slides with name - Brand Positioning Platform Architecture Identity Opportunity. This is a six stage process. The stages in this process are Brand Positioning, Brand Marketing, Brand Promotion. Presenting this set of slides with name - Brand Positioning Superiority Expensive Value Quality. This is a four stage process. The stages in this process are Brand Positioning, Brand Marketing, Brand Promotion. 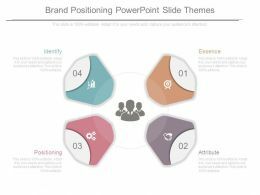 Presenting establish brand positioning powerpoint slide templates. This is a establish brand positioning powerpoint slide templates. This is a three stage process. The stages in this process are Tenderness, Target Customers, Company And Product, Price, Durability And Safety. 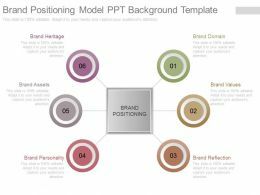 Presenting brand positioning model ppt background template. 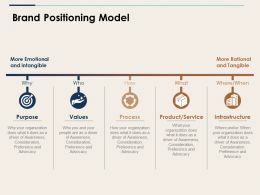 This is a brand positioning model ppt background template. This is a six stage process. 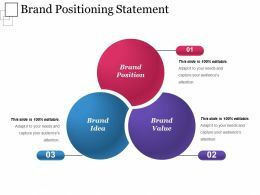 The stages in this process are brand domain, brand values, brand reflection, brand personality, brand assets, brand heritage, brand positioning. Presenting establish brand positioning ppt sample presentations. This is a establish brand positioning ppt sample presentations. This is a three stage process. The stages in this process are tenderness, target customers, key benefits, price, company and product. Presenting establish brand positioning presentation powerpoint templates. This is a establish brand positioning presentation powerpoint templates. This is a five stage process. The stages in this process are company and product, target customers, key benefits, price, value proposition. 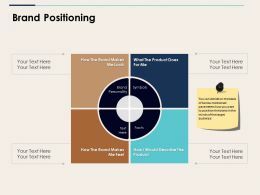 Presenting ppt marketing brand positioning powerpoint slide deck. 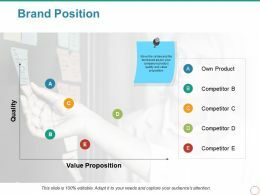 This is a marketing brand positioning powerpoint slide deck. This is a six stage process. The stages in this process are product, people, person, process, promotion, place. 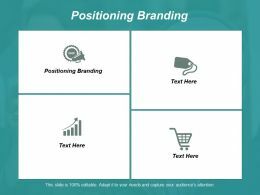 Presenting this set of slides with name - Brand Positioning Framework Presentation Powerpoint Templates 1. This is a three stage process. The stages in this process are Ideal Positioning, Don T Even Think About This, Competitor Positioning, Risky, Business. Presenting this set of slides with name - Create A Brand Positioning Ppt Ideas. This is a four stage process. The stages in this process are Market Definition, Reasons To Believe, Brand Promise, Target Customer, Business, Icons. Presenting this set of slides with name - Brand Positioning Model Presentation Pictures Template 1. This is a five stage process. The stages in this process are Purpose, Process, Values, Infrastructure, What. 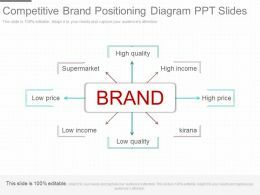 Presenting ppts competitive brand positioning diagram ppt slides. 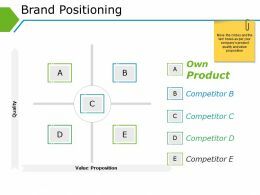 This is a competitive brand positioning diagram ppt slides. This is a one stage process. The stages in this process are high quality, high income, high price, Karana, low quality, low income, low price, supermarket. 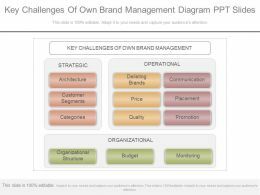 Presenting this set of slides with name - create a brand positioning statement ppt diagrams. This is a four stage process. The stages in this process are Target Customer, Market Definition, Brand Promise, Reasons To Believe, Icon. 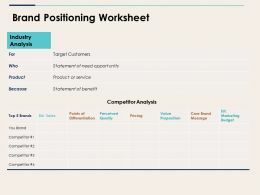 Presenting this set of slides with name - Brand Positioning Worksheet Presentation Ideas Template 1. This is a two stage process. The stages in this process are Industry Analysis, Competitor Analysis, Target Customers, Product Or Service, Business. 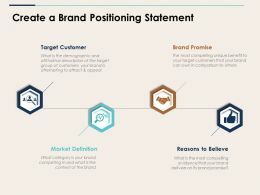 Presenting this set of slides with name - Establish Brand Positioning Ppt Infographic Template 1. This is a three stage process. The stages in this process are Company And Product, Target Customers, Key Benefits, Price, Value Proposition. 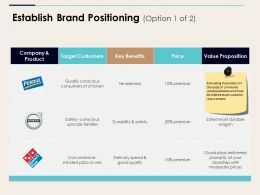 Presenting this set of slides with name - brand positioning model ppt examples slides. This is a five stage process. The stages in this process are Purpose, Values, Process, Infrastructure, Product Service. 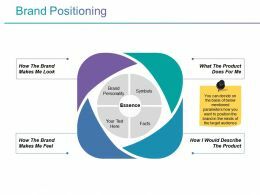 Presenting this set of slides with name - B2b Marketing Strategy Showing Messaging Brand Positioning. This is a one stage process. 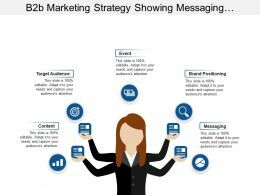 The stages in this process are B2b Marketing Strategy, B2b Marketing Plan, B2b Marketing Approach. 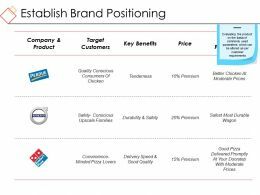 Presenting this set of slides with name - Marketing Communication Plan Showing Advertising Brand Positioning. This is a nine stage process. 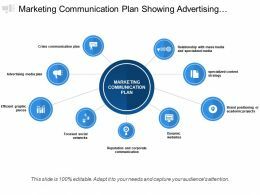 The stages in this process are Marketing Communication Plan, Marketing Communication Strategy, Marketing Communication. Presenting this set of slides with name - Brand Positioning Brand Product Look Feel Personality Essence. This is a four stage process. The stages in this process are Brand Positioning, Brand Marketing, Brand Promotion. 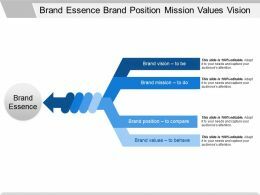 Presenting this set of slides with name - Brand Essence Brand Position Mission Values Vission. This is a four stage process. The stages in this process are Brand Essence, Brand Equity, Competitive Analysis. Presenting brand position powerpoint slide presentation examples. This is a brand position powerpoint slide presentation examples. This is a five stage process. The stages in this process are own product, competitor, value preposition, business. 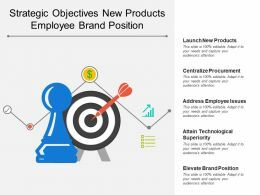 Presenting this set of slides with name - Strategic Objectives New Products Employee Brand Position. This is a five stage process. The stages in this process are Strategic Objectives, Strategic Goals, Strategic Plans. Presenting this set of slides with name - Brand Positioning Message People With Star And Position Icons. This is a two stage process. The stages in this process are Brand Positioning, Brand Marketing, Brand Promotion. 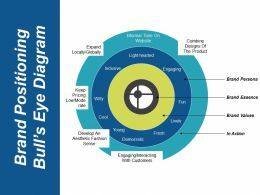 Presenting brand positioning bulls eye diagram example of ppt. 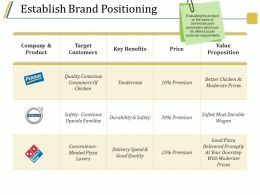 This is a brand positioning bulls eye diagram example of ppt. This is a three stage process. 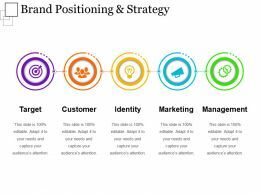 The stages in this process are brand positioning bulls eye, branding, brand strategy. 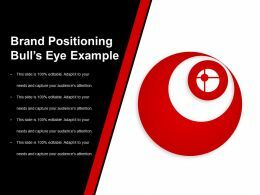 Presenting brand positioning bulls eye icon good ppt example. This is a brand positioning bulls eye icon good ppt example. This is a one stage process. 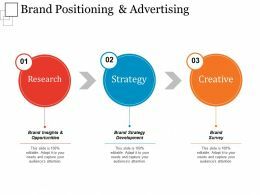 The stages in this process are brand positioning bulls eye, branding, brand strategy. 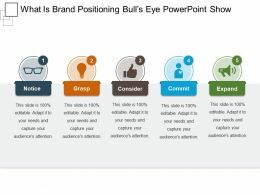 Presenting what is brand positioning bulls eye powerpoint show. This is a what is brand positioning bulls eye powerpoint show. This is a five stage process. 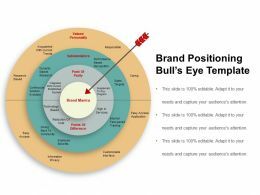 The stages in this process are brand positioning bulls eye, branding, brand strategy. 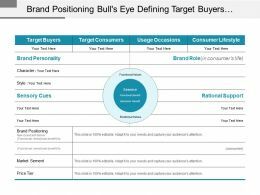 Presenting this set of slides with name - Brand Positioning Bull S Eye Defining Target Buyers. This is a two stage process. The stages in this process are Brand Positioning Bull S Eye, Brand Management, Brand Strategy. 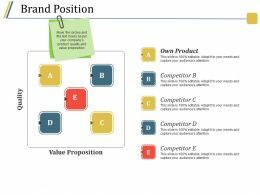 Presenting this set of slides with name - Brand Positioning Quality Value Proposition With Own Product And Competitors. This is a two stage process. The stages in this process are Brand Positioning, Brand Marketing, Brand Promotion. 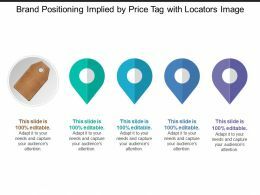 Presenting this set of slides with name - Brand Positioning Implied By Price Tag With Locators Image. This is a four stage process. The stages in this process are Brand Positioning, Brand Marketing, Brand Promotion. 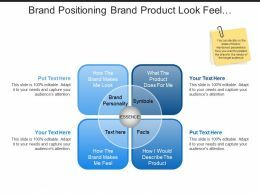 …anatomy of brand positioning ppt powerpoint slide images. 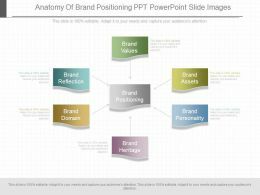 This is a anatomy of brand positioning ppt powerpoint slide images. This is a six stage process. 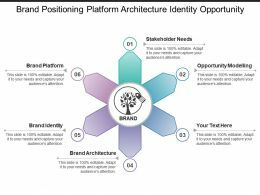 The stages in this process are brand values, brand assets, brand personality, brand positioning, brand heritage, brand domain, brand reflection.